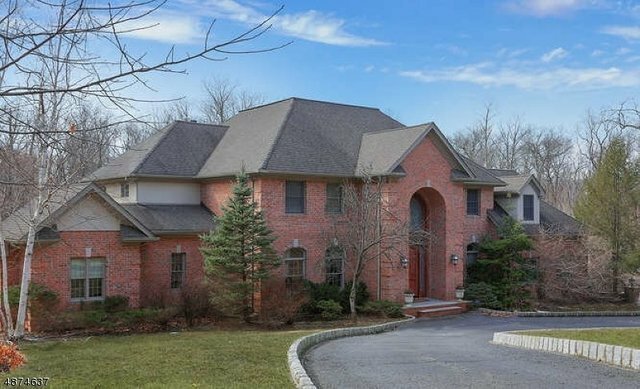 Colonial, Single Family - Watchung Boro, NJ Situated atop the Watchung Mountains, this stately custom built 5BR/5.1 BA Colonial provides luxurious living with an open flow! Peaceful quiet neighborhood w wooded views & fenced in backyard. Custom Mahogany front door leads into 2 story grand entrance w/Travertine marble & in-laid HW fls in spacious sun filled LR & DR w/custom molding! Cook's kitchen boasts beautiful custom cherry cabinets, limestone counters on breakfast bar & granite on 2nd center island! Beautiful breakfast area w/ custom wall of windows to enjoy backyard views! Large family room open from Kitchen, has /gas FPL w/limestone surround, access to back deck and side covered porch! 1st fl BR/BA can make aa perfect in-law suite or an office! 2nd fl MBR suite is stunning, 4 add'l BRs & 3 add't BA, HW floors! Radiant heat in Kit & all BA.